On the bright side, e-waste recycling is clearly a business on the rise. Electronic Recyclers International (ERI) takes in approximately 15 million pounds of e-waste a month and recently opened a seventh center in North Carolina, says CEO John Shegerian. Soon, it will open centers overseas. More than 99% of the materials that come through the door -- mostly glass, plastic and metals -- get recycled. Very little ends up in the landfill. The company is also working on a project with investor Alcoa to recover aluminum alloys from LCD and plasma TVs. “There are close to 10 pounds of aluminum in a single TV,” said Randall Scheps, director of consumer electronics at Alcoa. 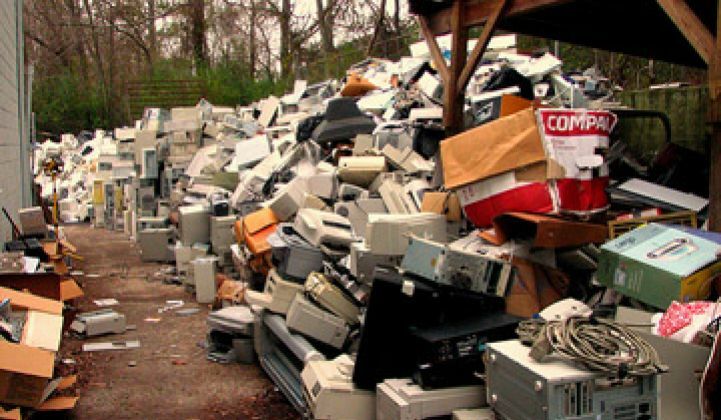 If recycling can live up to its promise as one of the growth industries in green, e-waste recycling could become one of the most lucrative segments. We’re up to our necks in electronics, a lot of the raw materials are growing in value, and government regulators are devising policies to ensure they don’t end up in dumps. Associated Tele-Networking, which specializes in recycling telco equipment, takes in 35 semi-trucks' worth of waste a month. “They don’t have the room” to keep their analog, non-3G and 4G equipment, said co-founder Creighton Bildstein. The gold, silver and Rare Earth minerals in circuit boards have give telcos an economic incentive to recycle. ATN serves as a consignment broker: it recycles and resells minerals and gives a portion back to the original owner. Many recyclers still simply dump old equipment in China, where toxic materials leak into the soil and water system. The situation is probably worse than it was 10 years ago, said Sheila Davis of the Silicon Valley Toxics Coalition. Security is also a problem. Many recyclers don’t shred drives -- they just resell them, along with their credit card numbers and company secrets, said Shegerian. Even federal documents have wound up on resold flash drives. Plus, consumers often don’t know or don’t care about recycling. Best Buy took in close to 85 million pounds of e-trash in 2010. But it often takes $10 gift cards or other spiffs to motivate consumers. It’s still not a natural part of the electronics buying experience. How many old PCs do you have in the house? And the answer to the question: the average American generates 4.1 pounds of waste a day, says Shegerian, a walking treasure trove of fun trash facts.